A Light hearted blog to start the new year, on the topic of …. Well the New Year. For many years I have either worked (volunteered with St John Cymru) the new year or spent in Cardiff, so this New Years was to be different. I vowed after many years of saying and wanting to go I would spend the New Year in my old town of London and be one of those people standing in the cold anticipating Big Ben’s Strikes signifying the beginning of the New Year. After starting my journey from Wales at 10am, reaching London at 12pm, I had at least 7 hours to shop and chill with friends. So the only place for it could be the newish Westfield Mall in Sheppard’s Bush. A good old cheeky Nandos later and we went to the Riverbank (Embankment). We had to confront a large queue and done so in a very patient “British way”, however someone didn’t tell the hordes of people cutting in closer to the front at Trafalgar Square. Once in past the ticket area we were free to walk around, chat etc being that it was only twenty mins to eight, so we had time on our side. The time to be honest goes quickly and atmosphere is brilliant, many tourists and other revellers from across the UK all getting on and exchanging pictures and memories. The music in the background helped a lot, especially the Queen + Adam Lambert performance. 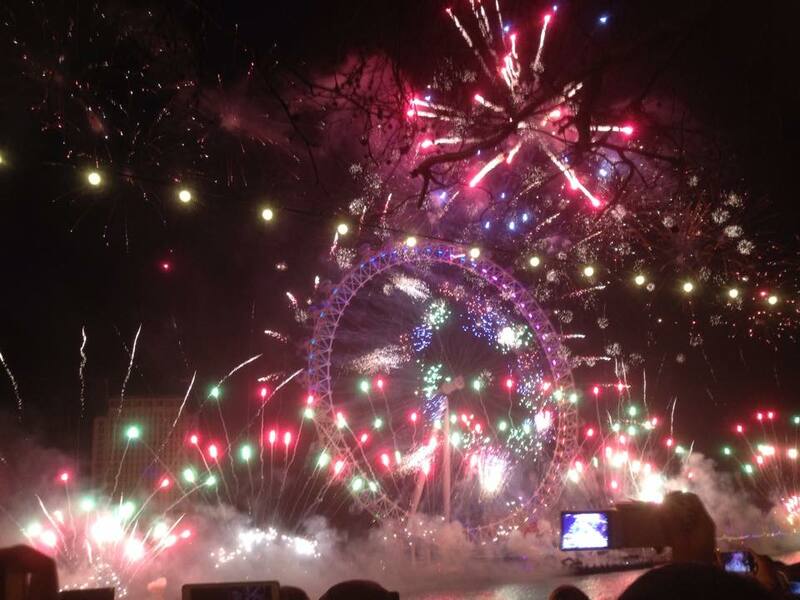 As time progressed we got closer to midnight and said hello to the world via the good old BBC at quarter to midnight. 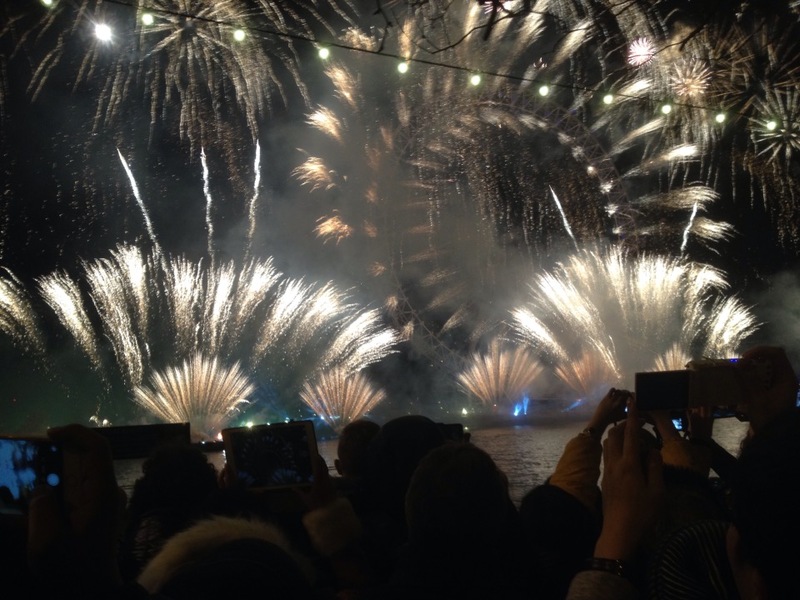 Then obviously Big Ben stuck the New Year in but after the first dong, eyes were firmly towards the London eye – well some through their phones facing the said direction. The firework show was thoroughly enjoying and is very much better than being glued to the TV watching it. There’s nothing like being there in person, even though trees had blocked my view of Big Ben, at this time I was more interested by the events ahead of me- which yes I did shotgun a prime space. Very much worth the £10 per ticket paid, how did 500,000 people fit in the area at all ? There was just enough safe room with 100,000 as ticketed. So the show was over and time for bed. However that was not the end of New Years celebrations oh no, London has a fantastic New Years Day Parade, which to be fair showcased much of what is good about London and those who visit it. Many an American marching band and cheerleading group came past, all happy and passing on New wishes- None of the grumpiness normally associated with London. For those contemplating going – DO ! The people of Ireland are fighting back against what is deemed a step too far in terms of governmental austerity measures within the country. The Irish Government until recently paid for the treatment and servicing of water within the state, however this is changing. The government is privatising this branch in an attempt to “save” €1bn per year as part of conditions set by Brussels. The main political parties of the state could find themselves out in the cold when it comes to the general election scheduled for 2016. So the feeling is yes the Government has bitten off more than it can chew. In the UK water rates have been established for some time and the commodity of water has always and always should be free to all. The Irish feel they are being asked way too much in order to put right the banker’s problem. The world media are watching with great interest, however very rarely reported by media sources within the state, bringing displeasure that the peoples media is serving the interest of the privatisers and not the people. In many areas of Ireland and some where I go myself, where family live, the water is undrinkable which begs to question why on earth are the people being charged for a service they don’t receive? 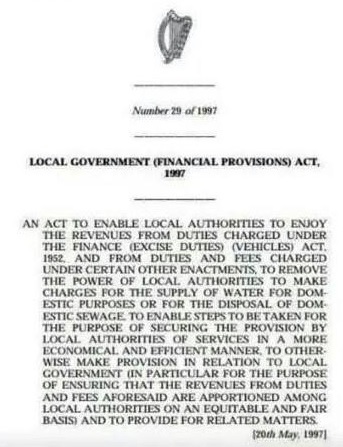 Even more criminal is the fact that since 1997 the people of Ireland already pay a subsidence for water. 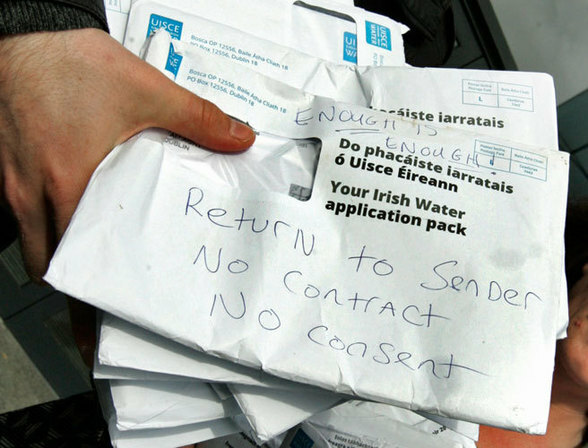 Many see that those in government are receiving back handers to drive this hugely despised policy through from the top with the Taoiseach to the backbencher TD’s (MPs to me and you in the UK) The Irish Government (Fine Gael- Labour Coalition) has set out that each household in Ireland is required by law to host a water meter. The water meters have been met with much resistance in the streets and estates right across the state. The people have had enough of austerity and feel that the government regardless of any of the main parties no longer represent them. This leading the path to new openings within the political party system normally seeing fine Gael or Fianna Fail elected, to the likes of others, such as the increasing number of Sinn Fein representatives for example being elected. There is the more interesting point seeing a 2% duty imposed on everything the Irish people purchase and a 5% vehicle duty which would ensure NO FURTHER CHARGES were applicable. Thus a sign of the government charging twice for the same service but also the fact it is going against itself in a short term period. Joan Burton Tánaiste (Deputy Prime Minister- Labour) has been slated after comments she made “All of those protesters I have seen before seem to have extremely expensive phones, tablets , video cameras” and “Hollywood would be in the ha’penny place to what’s been done here”. To the response of the electorate tweeting or facebooking back reminding her who pays for her expensive phones and how out of touch she is. Some have even started a countdown until she is “booted” out of office. Her ministerial car was stuck for a number of hours by peaceful protesters surrounding her car. (http://www.thejournal.ie/joan-burton-water-protest-1782187-Nov2014/ ) A Fine Gael Councillor has met trolling after making the comments, Laura McGonigle A Councillor in the city of Cork tweeted “They should collect all the rain water while out marching today and drink that for the week” ‘they’ meaning the protesters. ( http://www.thejournal.ie/fine-gael-councillor-facebook-rainwater-1759765-Nov2014/ ) There have been a number of protests in all major town and cities with tens of thousands marching the streets in each one, including one in Dublin which saw a hefty 50,000 people marching a number of weeks ago. There is a national protest day which will see numbers into the hundreds of thousands surround Dail Eireann on 10th December under the banner “Right2Water”. 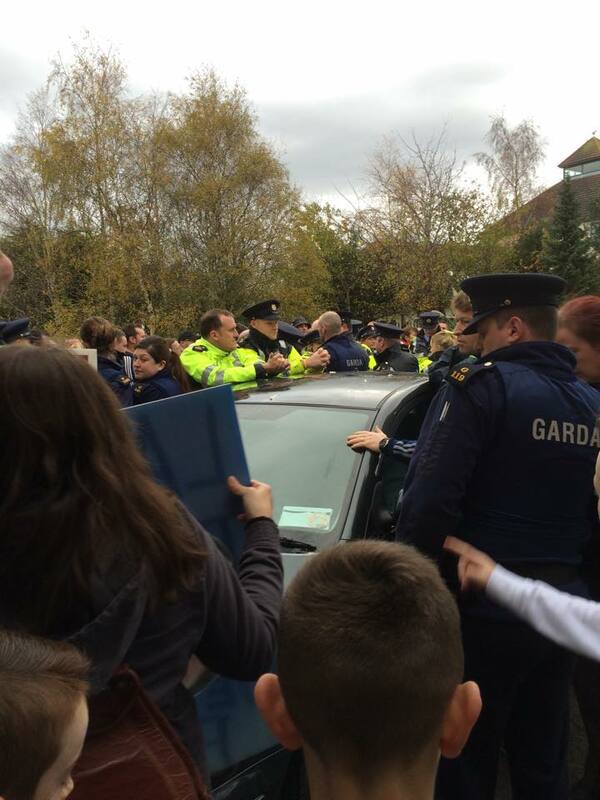 ( https://www.facebook.com/Right2WaterIreland?fref=ts ) The workers installing the apparatus have been met with much resistance and barricades to stop them from entering areas. The police have been brought in and there is now many a video posted on Youtube and the like showing the brutality the police are using in order to support and maintain the work to install the meters. It is noted by a number of sources that the police are receiving bonuses or seeing their budgets protected while other departments are seeing savage cuts. To put this into perspective the Irish people have to pay to see their doctor (GP), for school books of all kinds, and cost of living is close to a third higher than that in the UK due to the Euro. The Welfare system is close to being annihilated. The TD’s receive much more expenses and noted corruption within the political system than that perceived within the UK. The Taoiseach questionably receives more than most heads of state in the world at €200,000(£159,836), even more than David Cameron (£142,000). Cameron who is the head of state of a country with 10 times the population of Ireland and a more powerful world player than that of the Irish Taoiseach. However, this is only one of many ways the people have been protesting, many have been destroying the apparatus costing just over £100per house to install. Some have been taken by “fairies” (http://www.thejournal.ie/water-meter-fairies-illegal-irish-1773631-Nov2014/ ). Some have been picked up (some being flung over Dail Eireann’s walls) others have been sunk in cement making them unworkable. There is mass resistance on this topic and will test the nerve of the coalition as it enters its final year before the general election. The fact remains that the government has very much bitten more than it can chew, the closing question is how far will both sides go until the other backs down. Is Recycling in Wales a load of Rubbish ? Wales sees higher recycling targets than the rest of the UK and Northern Ireland at 58%. However in years to come we the public are expected to reduce waste even more due to Welsh Government placing more and more pressure on local governments. There are many issues that are faced by the public as across Wales there are 22 local recycling schemes all of which differ from each other. Question being, is it a load of rubbish? Does it work? Does it penalise people where they cant do any more or see it as a chore to get it right? 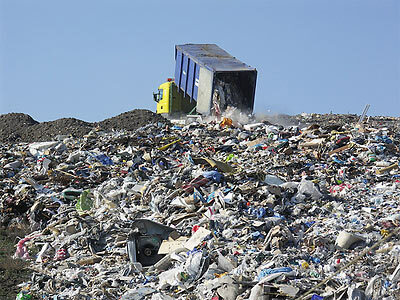 Welsh local authorities have mostly introduced a fortnightly collection on refuse waste (landfill) and some are even contemplating a three week collection in attempt to avoid fines for land filling rubbish. Swansea sees a three-bag limit, but no actual physical bin. One must question the sanitation issues that arise i.e. rats and other animals who would strive off such waste. The aim of this reduction is to avoid hefty fines as what will be instigated in the next few years, as a way to make sure councils are doing their part in reducing waste. Though are reduced collections necessary the right answer? I personally believe fortnightly is the max limit as long as other factors are in place i.e bins to place bags in to avoid rats. The fact that there is 22 local schemes causes an issue to locals, more needs to be done to further a more universal system whether regionally or even nationally. Another huge issue is what can be recycled, many items are not recyclable more needs to be done to ensure that manufactures look to recycle unwanted products from their consumers but also have legislation looking at things that could be made by items that can be recycled. I’m speaking specifically about food products, the mass amount of packaging that goes with food products. To say food is the only one seeing issues, one only has to look at toiletries, toothpaste tube comes in boxes, which in effect is causing excessive waste, even when the cardboard is recyclable why was it used in the first place? The main issue is locals up and down Wales are being penalised, when in a lot of cases they cannot really be blamed for the confusing systems in action across the country. They cannot be fully blamed for the items they purchase, so it is of my belief that legislation needs to be brought forward, allowing Wales to set the trend in the UK and even potentially have influence the rest of the UK’s ability to recycle. Legislation needs to address both materials products are packaged in, but also address excess packaging on items in the Welsh area. Lets face it Wales has already led the way on plastic carrier bags seeing a huge reduction, benefiting the environment and communities and their through the money raised from the “tax”. Lets see a tax in addressing excessive packaging and none recyclable materials, hopefully this will see consumers applying pressure on business to change. The public are already on mass doing what they can, given the circumstances, now its time for local and national (Welsh) government to be bolder in their approach in tackling the issue from another angle. In doing so they need to work better with local authorities in order to make it as easy and effortless for the populace of Wales. A universal recycle list should be initiated to stop confusion amongst local authorities. Thus all in all everyone’s happy and waste is reduced and all are playing their part in reducing land waste, compared to the failed 22 local authority systems as seen in the current day, with none recycling the same. We could effectively beat Germany and Austria’s record targets of 60% by a landslide. With low numbers voting in the recent European elections seeing just under a third of the eligible voters, 31.5% turning out to vote. This is pretty dismal in terms of the democratic stability we hold so dear, above all else. Is our democratic system outdated and expensive? Its long been said a rainy day can deter voters but in modern times apathy has been seen to occur in discussions , tv interviews and social networking across the country. The older population tend to vote in numbers but the other ages and social groups tend not to be able to or tend not to, for the effort some see to vote is more than what they see. The potential to engage and see these potential voters actually vote by using other methods, may go hand in hand with modern times. More young people tend to vote on a Saturday night for their Xfactor or BGT choice on a weekly basis, from the comfort of their own home. So it is time to really consider if the political class need to open up ways that can engage but also uphold public confidence in elections and their results. Fears are shown in many ways like extra voting, wrong voting (great video of the Mccain and Obama election 2008- (https://www.youtube.com/watch?v=ArC7XarwnWI) Estonia has seen at least 9% of voters vote by internet or text in recent years and increasing. 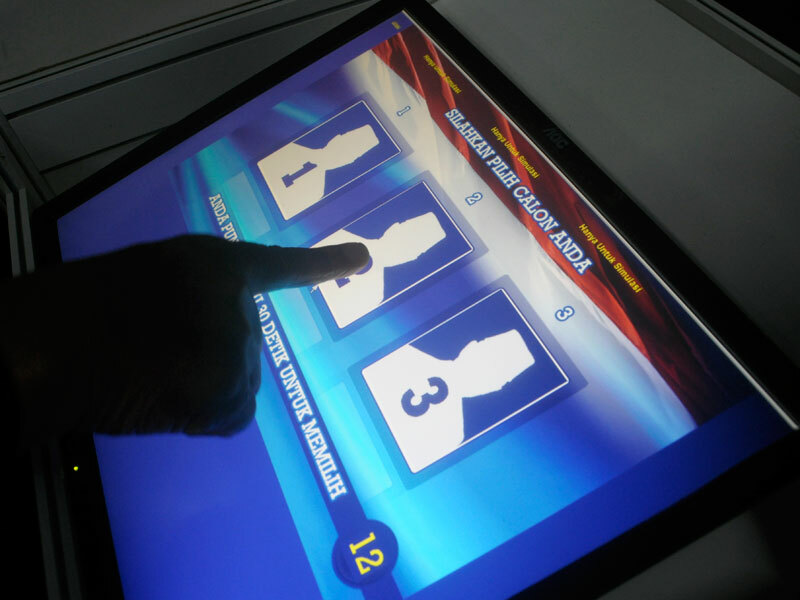 Many votes that occur within political parties and organisations, happen via paper as well as a secure internet option using randomly generated codes for each voter. Could Britain follow suit? I personally believe, though it would be a good idea to initiate secure electronic voting, the political classes sadly do not want to initiate change in this regard as it stands. In the UK there are examples where it is already in use, for example student unions across the UK, have seen significant increases in their turnouts, as well as those voters noted, the millions who vote on Saturday nights to reality TV but not to leaders of the country. The new generation of politicians may enable better focus and even trial this, but we remain years behind with the times. Britain is about to change the way individuals are registered to vote, where rather than list those of eligibility, it is up to individuals to register. Arguably another outdated method, which by all predictions will see at least 10% of the electoral register disappear with those failing to register. There is a set time before elections in which non-registered voters may register and vote. We are in the 21st century and surely those presiding over elections could register electors on voting day itself having a shared database and ensure safe registration but also enable secure ballots without the risk of multiple votes. The way the votes are counted is something that has not changed in many a year, it is counted manually and is highly time consuming. 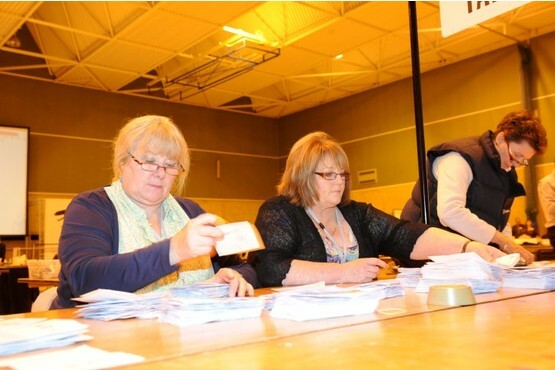 The question if this could be sped up using electronic counting machines is one that has been contemplated over time. It is expensive and results not known until the early hours of the morning- past the time many, except the political faithful go to bed. We live in a fast moving society and as already noted elections take some time and practically people wake up to find out who will be the next leaders. So all in all, the system in use is outdated and slow and expensive, the way we register voters and conduct the vote is also slow and feel that we in the UK should look into this more and look to trail this somewhere. Internet voting happens within organisations and political parties already and sees Estonia both internet voting as well as text vote. Enabling these may enable voting to come to the voter , rather than the voter go to the ballot. Time for change ?